Whether it is complying with relevant legislation or physically locating underground assets, safety should always remain at the forefront of everyone’s mind. Pro-Visual Publishing, along with the National Electrical and Communications Association (NECA), has released its most recent edition of the Electrical Industry Guide to Workplace Safety. Within a business, there are a variety of roles that individually contain responsibilities to help operate the workplace smoothly and efficiently. These roles include a Person Conducting a Business or Undertaking (PCBU), officers and workers. Underground assets involve locating pipes, cables, gas, water, etc. It is vital that workers are suitably qualified before excavation work begins, in order to identify the whereabouts of the assets in a safe manner. Electricians are subjected to all sorts of dangerous working conditions, such as working live on switchboards. This can result in unforseen accidents and, worse still, fatalities. Therefore, safe work procedures are necessary to establish in the workplace to outline relevant safety tips and guidelines. A significant topic highlighted in this year’s edition is MATES In Construction, which is an industry initiative focussing on implementing ways to reduce the suicide rate in the electrical industry. Workers are encouraged to look after one another and address any issues that may be affecting them. This is proven to be a successful program for the industry, as it provides an enormous amount of support whilst concentrating on the health, safety and wellbeing of each and every worker. 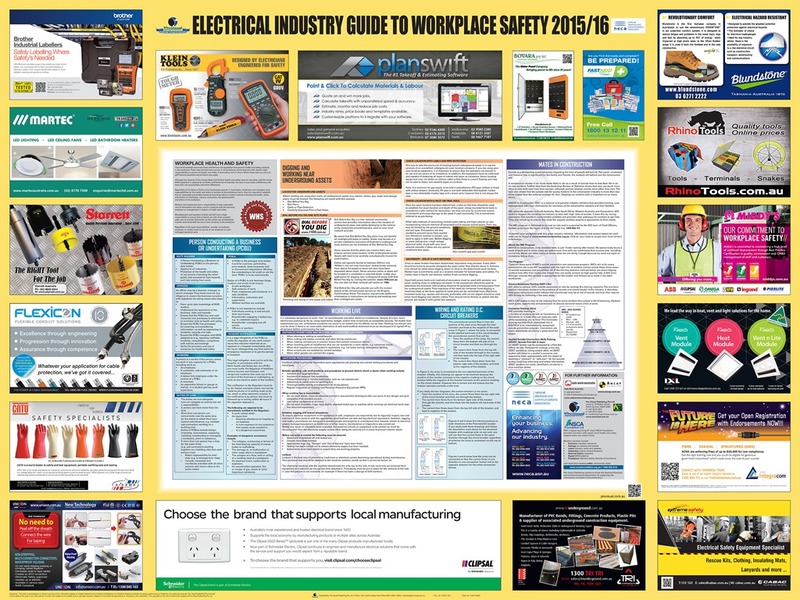 “I would like to thank all of the sponsors of the Electrical Industry Guide to Workplace Safety 2015/16. Their support has made it possible for the Guide to be distributed free of charge” – John Hutchings, CEO, Pro-Visual Publishing. Pro-Visual Publishing is the leading specialist in wall mounted workplace health & safety, food safety & hygiene and health and wellbeing information resource Guides. Each Guide is practical and informative, providing a quick reference point for staff. Pro-Visual Publishing’s Guides are designed to inform, motivate, educate and above all keep people and their workplaces safe!